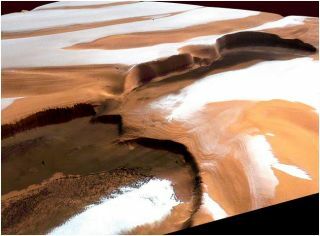 Pockets of water ice on the southern pole of Mars, such as these, have been stopped from their once-routine migration by a cap of dry ice, or frozen carbon dioxide. Planetary scientists think the migrations was fueled by an eccentric wobble in Mars'tilt. The bone-dry desert of present-day Mars may seem like the last place you would look for water, but the Red Planet actually contains a wealth of water locked up in ice. Evidence that Mars once supported liquid water has been mounting for years, and exploratory missions have found that water ice still exists on the planet's poles and just beneath its dusty surface. Accessing that water could require digging it up and baking it in an oven, or beaming microwaves at the soil and extracting the water vapor. Yet no mission has attempted to extract water on Mars or any celestial body beyond Earth in appreciable quantities. NASA's Phoenix Mars Lander inserted the four needles of its thermal and conductivity probe into Martian soil during the 98th Martian day, or sol, of the mission and left it in place until Sol 99 (Sept. 4, 2008). The Robotic Arm Camera on Phoenix took this image on the morning of Sol 99 while the probe's needles were in the ground. The science team informally named this soil target "Gandalf." "Here on Earth, we've experimented with different technologies to extract moisture out of the atmosphere or soil," said Ed Sedivy, civil space chief engineer at the security and aerospace company Lockheed Martin and program manager for NASA's Phoenix lander flight system. The question is, Sedivy said, "At the concentration of water we're likely to encounter and the temperatures we're likely to encounter [on Mars], how do we validate those technologies are appropriate?" Prior to Mars One's attempt to found a human colony on Mars, the Mars One group plans an unmanned scouting expedition. See how Mars One hopes to send an unmanned lander to Mars in our full infographic. Numerous studies have suggested that water exists on Mars, based on evidence from Mars orbiters and rovers such as outflow channels, ancient lakebeds, and surface rocks and minerals that could only have formed in the presence of liquid water. Today, Mars is too frigid, and its atmospheric pressure is too low, to support liquid water on its surface — except for very short spans of time at low altitudes — but frozen water can be found in the planet's ice caps and beneath the soil surface. NASA's Phoenix lander detected water ice at its landing site in 2008. The spacecraft dug up chunks of soil, and its onboard mass spectrometer found traces of water vapor when the sample was heated above freezing. More recently, NASA's Curiosity rover detected water molecules in soil samples analyzed by its SAM (Sample Analysis at Mars) instruments, suggesting Martian soil contains about two pints of water per cubic foot of soil. The most obvious method for extracting water would be to dig up the frozen soil and bake it in an oven until the water vaporizes. But there's another method that could be more efficient and require less digging. "For mining water off Mars, you want to get a high quantity of water," said Edwin Ethridge, a senior ISRU (In-Situ Resource Utilization) scientist and retired NASA consultant. Ethridge and his colleagues have studied water extraction in simulated lunar and Martian environments using microwave beams. In the lunar experiment, Ethridge and William Kaukler of the University of Alabama in Huntsville used a conventional kitchenmicrowave oven to "cook" some simulated lunar regolith, the layer of loose soil and rocks found on the moon's surface. The heat vaporized the frozen water, which was then collected and condensed on a chilled plate. Water absorbs microwaves (short electromagnetic waves) very well, but ice does not, so the microwave beams actually heat up the rock, which heats the ice upon contact, Kaukler explained. Of course, Mars isn't the only place scientists hope to find and mine water; the moon and asteroids are also prime targets. "Water enables so many things. If we're going to go out into the solar system, we're going to have to use the resources we find at the destination," Bill Larson, the NASA scientist who oversees the program to use substances found on other worlds, said in a statement. NASA's Lunar Reconnaissance Orbiter (LRO) sensed water on the moon remotely, and the Lunar Crater Observation and Sensing Satellite (LCROSS) that impacted the moon in 2009 found direct evidence of water ice and vapor in a perpetually shadowed lunar crater. Now, NASA and the Canadian Space Agency are developing a new lunar rover called Regolith and Environment Science and Oxygen and Lunar Volatile Extraction, or RESOLVE, which they hope to send to the moon this decade. RESOLVE, which was recently tested on lava beds in Hawaii, would be able to drill into the moon's surface and heat up the material to measure the amount of water vapor inside. NASA officials say that with a few small changes, RESOLVE could be deployed to search for water and other resources on Mars.